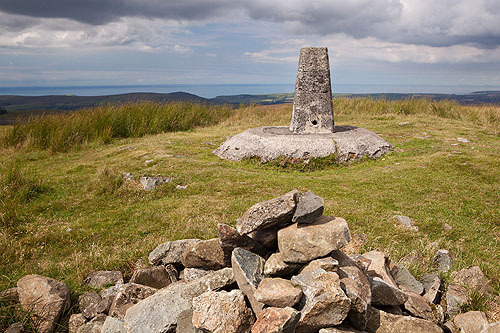 The walkers Cairn and the Trig point (1759ft - 536m), built on one of Foel Cwmcerwyn's Bronze age Cairns . Three grass covered Cairns are on the Summit . One Cairn at 300ft in circumferance x 4.5ft high - revealed a Cist with a cremation on excavation . The other cairns ,180ft x 4ft high and 120ft x 2ft high, appeared to be empty. A fourth grass covered Cairn is on the ridge running north down from the summit at SN 0949.3148. The mound is flat-topped, sub-circular, measuring some 18-19m in diameter and 1.2-1.5m high, apparently undisturbed.